As the world celebrates Heritage Day on Wednesday 18 April, Egypt’s first ever week-long nationwide heritage week will kick off with events organized by the Egyptian Ministry of Culture in collaboration with 14 culture- and heritage-affiliated government organisations. The collaboration includes the National Organization for Urban Harmony, the Arts and Folk Arts Academy and the National Cultural Fund, to name but a few. Below is the list of all of the festival's events nationwide. All museums will be opened for the public free of charge on Wednesday 18 April. The center will be hosting a number of events, including a two-day exhibition by the Siwa Shop for Hand Craft, from 18 to 19 April, starting at 1pm each day. There will also be authentic handicrafts from Halayeb, Shalateen and Fayoum on display. El-Hanagar will also be holding a photography exhibition on the theme of Egypt's moulid religious festivals. 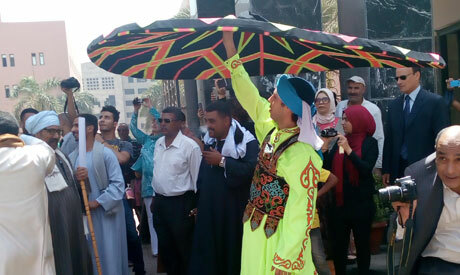 The Egypt National Folklore Troupe will make an appearance on 18 April, putting on a dance show starting at 5 pm. On April 19th, at 6 pm, there will be a puppet performance, including traditional Egyptian shadow puppets and the famous Aragouz character. The museum will put on several folk handicraft workshops on 18 April between 10am and 2pm, along with various live performances. Among the highlights will be the whirling "tanoura" dance and music played on the mizmar, Egypt's famous wind instrument. The academy will open its premises in Haram district at 11am on World Heritage Day, with a full program of events planned. The celebration kicks off with music on the mizmar and drums, followed by the inauguration of a photo exhibition. The famous Aragouz puppet will make an appearance, after which there will be traditional stick-dancing from Sohag governorate. The day will end with one hour of enchanting and authentic folk music from Rayes Zakaria and his band, which specializes in El-Semsemya tunes. This medieval palace in historic Cairo will be put on a photo exhibition titled Minarets and Bells in Egypt's Sky, running from from 21 to 28 April, starting each night at 7pm. In the heart of downtown Cairo, the opening of renovations of Al-Sharifain street will be accompanied by a street art carnival titled Art Street beginning at 6:30pm on Wednesday, 18 April. A collage workshop will be held at the Rateb Seddik Cultural Center in Cairo's El-Monib district on Wednesday 18 April at 10am. A workshop on the Arabic language and linguistic heritage will be held at the Ahmed Shawki Museum in Giza on Wednesday 18 April at 10am. Workshops on khayamia patchwork, copper arts and glass making will be held at the center from Wednesday 18 April to Tuesday 24 April, starting at 10am. A workshop on storytelling and folk children's games will be held at the Asmarat Cultural Palace in Cairo from Wednesday 18 April to Tuesday 24 April, starting at 10am. Workshops on folk handicrafts such as khayamia patchwork, pottery and tapestry will be held from Wednesday 18 April to Tuesday 24 April, starting at 10am. An exhibition of rare photographs of Egypt by renowned French photographer Emil Pishar will be held under the title Eyes Capture, Heritage Remain. The exhibition will open at 7pm on Thursday 19 April and will run until 24 April. A performance by Al-Hakiba theatre troupe, directed by Intesar Abdel-Fattah, will be held Thursday 19 April at 8pm. Performances by numerous folk art troupes will take place on Friday 20 April at 4pm. A street carnival hosting various folk art troupes will take place on Saturday 21 April at 3pm. A carnival will also close the heritage week at al-Muizz Street starting at 7pm. A seminar on the cultural heritage in folk arts will be held Sunday 22 April at 6pm. 14 El-Khalifa El-Mamoun Street, in Manshiet El-Bakri: A seminar on the temple of Abu Sembel will be held at the museum on Wednesday 18 April at 6pm. A concert of folk songs will be played by the visually challenged Tarab Arabic Music at the Manshiet Nasser Cultural Palace on Wednesday 18 April at 6pm. A workshop on clay motifs and the Japanese art of origami will take place at the museum on Wednesday 18 April at 10am. A concert of classic folk songs will be held at the cultural center on Wednesday 18 April at 7pm. A seminar on the history of Andalusi music will be held at the museum on Wednesday 18 April at 7pm. A seminar on the architectural heritage of Rashid (the historic Nile city of Rosetta) will be held on 18 April at 7pm. School trips and storytelling events will be held at the museum from Wednesday 18 April to 24 April starting at 10am. A performance of Siyra El-Helalya (The Epic of Beni Helal) will be staged, as will a stick art performance on Wednesday 18 April at 10am. A cultural caravan will feature traditional Siwa handicrafts and folk arts on Wednesday 18 April to 23 April starting each day at 10am. A selection of folk performances will be held at the yard on Wednesday 18 April at 6pm. Workshop on numerous handicrafts arts will be held from 18 - 24 April starting at 10am. A drawing workshop for children to highlight the impact of architectural heritage will be held on 18 April starting at 10am. A workshop for women's handicrafts with a special focus on palm tree crafts will be run at the same time at the same venue. Performance of El-Semsemya traditional folk band at the palace on Wednesday 18 April at 10am.